We all remember the memories of our school bus travel. The fun, the friends are in our thoughts still today. But were we safe? Are your kids safe today when they travel to the school? There are many cases that we know in which improper maintenance of school buses and the carelessness of the schooling authorities lead to major accident, taking the lives of innocent children. Mahindra Tourister keeps you in control of how your kids travel to school and come back home. It offers a stress-free answer to your kids’ travel related difficulties. At Mahindra, We are the first one to master the art of building custom made buses to keep you stress-free and in control, by designing it around the needs of our young passengers. 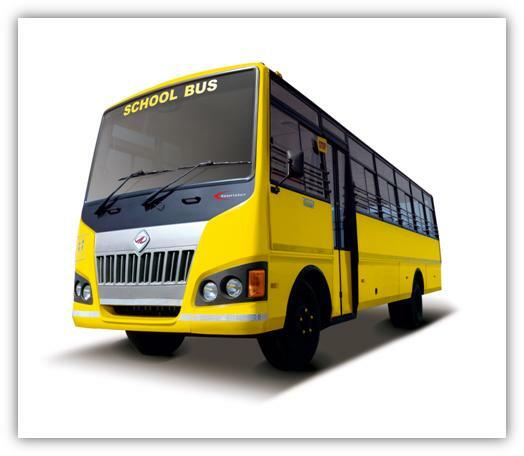 We have designed a school bus which keeps your kids safe and helps them to reach school and home back in convenient manner. School bus drivers always face the prospect of encountering not-so-friendly fellow motorists on our nation’s roads, and defensive driving for them takes on a greater meaning, considering their passengers. Mahindra Tourister helps them to keep control of the situation and safely reach the destination. Today the Mahindra Tourister with its customized features is engineered for efficiency and provides greater safety and reliability, without compromising the comfort. The Mahindra Tourister buses are available in 16 seater, 25 seater (CRDe and CNG), 32 Seater and 40 seater. Safety – Anti-Skid flooring and stop buzzer. Convenience – Chin guard and grab handle, Grab rail for easy entry and exit. Technology – Fuel efficient proven DI and NEF engines. 3rd Generation Gas injection systems.